We continue up the steep mountainside, Sammy more or less bounding up, myself…well, let’s not talk about me. There are several stone bridges across ravines which Sammy tells me were built when people were carrying up cement and materials to build the airstrip (I can only begin to fathom the sweat and toil that involved!). We walk a little further and then Sammy jumps about animatedly. “What, more bees? Wasps?” I ask. “Cut me a stick, cut me a stick”, he yells.”Ants, it’s ants isn’t it?” I say, my eyes darting about the forest floor. He frantically shakes his head. “Cut me a stick!” I do as he asks, cut him a small one and he uses it as a spear, hurling it at a brown spot on the jungle floor. “Another, cut me another!” The second is more to his liking and he proceeds to beat the ground violently, his usually kind features transformed in apoplectic rage. It is a labaria, or fer-de-lance (Bothrops atrox), one of the most dangerous snakes of the tropics. Extremely temperamental and quick to bite, these snakes are responsible for the most fatalities attributable to bites. The snake writhes in pain, and the skin is stripped off from its body in parts. “Okay, I hold it down now”, he said pushing the snake up behind the lance-like head, “And you…you cut it. In the middle or high, not too low”, he says, speaking quickly in his excitement. I swing the machete and cut the snake a deep blow in the centre. “Good, good”, he says and lets go of the snake that is nearly in two pieces. We are both panting with the effort and excitement. “That was close”, he says. Telling me how he had just seen a slight movement in his peripheral vision and how he had quickly jumped out of the way. “Like that”, he says, bringing his hands together to show how close it had been. Sammy often talked about his having trained his senses of smell, hearing and vision when we had discussed snakes in Amatuk with King and the others. As they traded stories of bushmasters and labaria, coral snakes and two headed snakes. But when Sammy walked right into the snake’s path it seemed like all that talk in the village had been just that. I nod, more just happy for the additional cause for rest than anything else and then get up to go on. As I step over the mutilated body, I can’t help but feel regret and disappointment with myself that I hadn’t stood up to Sammy and stopped him. But as I move forward, the snake rights itself, flicks its tongue angrily and makes as though to strike me. “The stick, the stick”! This time it is me who is yelling. I guess I was on the other side of the stick this time. Sammy pins the snake’s head again. “Die you fucker, die”! I shout as I bring the blade down again and again. I hit the thing so hard I actually dent the stainless steel blade in several places. I don’t realize my own vehemence until trembling, I smell the acrid flint from the steel hitting the rocks and gaze at the completely severed head. Sammy is glad that the job is done. He is happy, but not gleeful, he hates them but he doesn’t rejoice in its death. It is just a fact of jungle life. Poisonous snakes must be killed lest they harm someone else. Though there’s a strict policy in the national park of no hunting or killing of animals, Sammy feels quite justified. “It was right on the trail, when those other tourists come up, it could have gotten them”. There’s a certain truth to these words, but I would as soon have just thrown it off the path. I felt awful and guilty, walking the next half hour up to the falls. 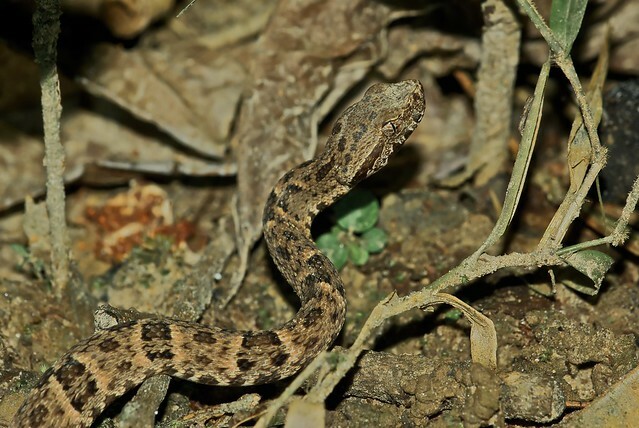 Fer-de-lance (Bothrops atrox). This is actually a shot of one that I nearly stepped on in Peru with my sister, since I was too busy killing this one to have my camera out. Out in the open at the top of the mountain near the falls it is ridiculously hot without any tree cover. The ecology has changed as well. It looks more like highlands, with smaller, stunted trees and more shrubbery. We necessitate more breaks despite the land being flatter. We head first to the Warden’s station to register and introduce ourselves. Here I pay the $15 park pass. Sammy looks at me, “you’ll cover this”, there is no hint of a question in his voice. A please and thank you is generally all I require, however, I get neither and my animosity towards my companion can’t help but grow. We excuse ourselves from the warden’s and continue on towards Mendie’s landing where Sammy is good friends with a miner there. It is a short and pleasant walk. When we arrive we set up camp, bathe down by the river which feeds into the falls and set up supper. 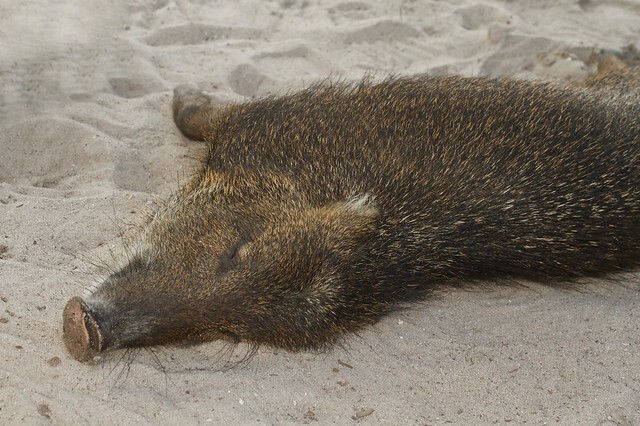 At this point I am introduced to Gigi, a 30 pound wild peccary that has been domesticated by the family. An Amerindian hunting party had killed the mother. When they cut her open they found a baby piglet. So, they bottle raised it and it came to be one of the family. Gigi has a very playful personality, she will run about like a dog, snorting and mouthing anything interesting. She takes particular interest in bright and shiny things which I discovered when my aluminium wind shield for my stove went missing. I followed the sound of delighted snorts until I reached a battle ground of twisted shrapnel on the ground. “Gigi!”, I reprimanded. The surprised pig jumped up and ran around me, tantalizingly out of reach, snorting with glee. 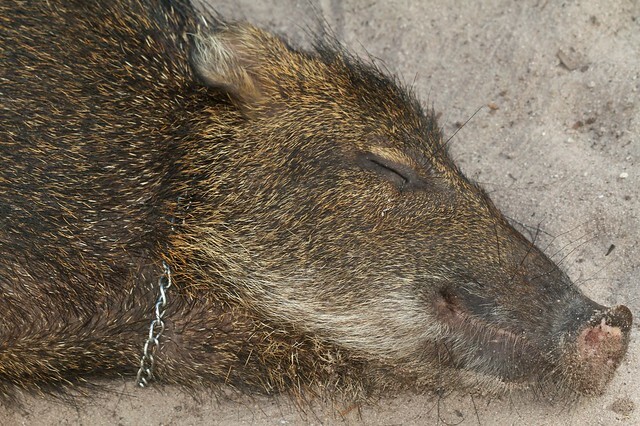 Gigi the ‘wild peccary’ napping after a hard day’s work eating my food and tearing into my equipment. But how can one not love that face! Gigi particularly enjoys getting her stomach rubbed at which time she will promptly collapse at your feet, wonderfully docile. As soon as you stop she will spring up and run circles around you snorting, belly flopping onto the sleeping dogs and rooting around for food. Kind of an impetus to keep on petting the girl, eh? I bought us a couple drinks at the store that Trisha owned to celebrate our arrival, and we settled in. I headed out to take some more photos and Sammy stayed in chatting and catching up with his friends. 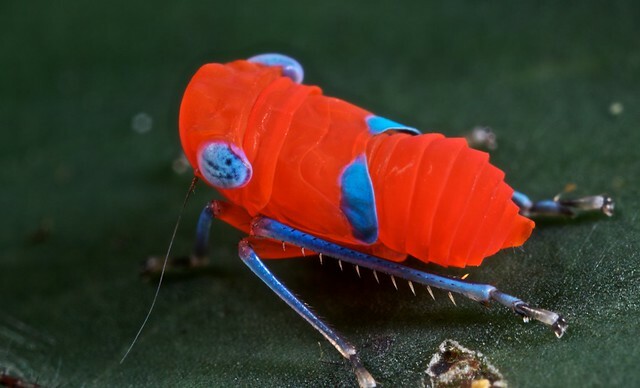 This vibrantly coloured leafhopper will usually have vivid colouration to warn off predators in a behaviour known as aposematism. The colouration generally warns would-be predators that the insect is distasteful, usually by a process known as bio-accumulation in which toxins and alkaloids in plants, roots, etc…on which the insect feeds are stored and concentrated. These then can either be released by the insect when it is feeling threatened such as exuding toxins through the joints, or more commonly the predator releases the insect after having taken a bite and learns not to make the same mistake twice. This warning colouration is particularly common in young/nymphal forms when insects are more vulnerable and must go through several moulting stages at which point they are easy prey, hence the colouration hopefully acts as a form of protection. Adult forms are more likely to rely on camouflage and mimicry. 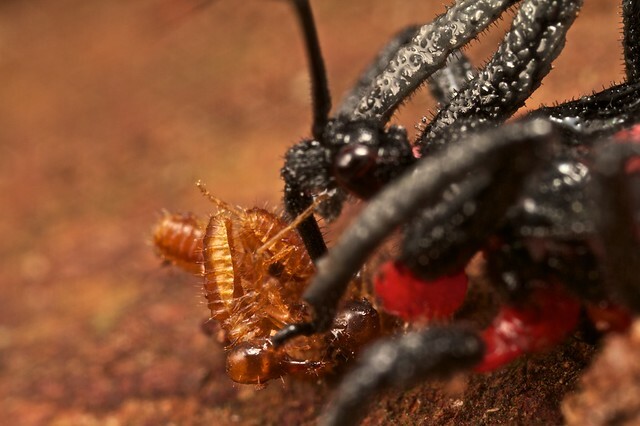 This Assassin bug (Reduviidae) is seen perched atop a termite tunnel on which it preys on unsuspecting termites. A great find tonight was an aposematic reduviid bug which is a termite specialist. It hangs out exclusively around termite nests and tunnels, burrows in with its strong forearms creating a hole. The termite workers stream out of any breach in their tunnel system to repair the damage due to their photophobic nature. When they come out, the reduviid bug, lying in wait poaches them one by one. It will actually store a ball of these termites under its body. 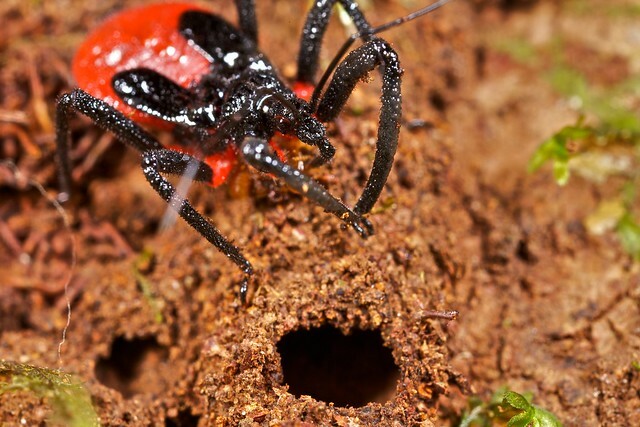 The purpose of which could be to mask itself in the chemical scent (pheromones) of the termites to protect it from the soldiers which are also streaming out of the tunnel and are better equipped to fend off this intruder.